The server contains two pressurized cooling zones: the main cooling zone and the power supply cooling zone. In the main cooling zone, six fans, arranged in two redundant rows, cool the motherboard, memory risers, and I/O cards. In the power supply cooling zone, the rear power supply fans cool the power supplies and the front drive bays. The server must maintain a pressurized plastic dividing wall seal so that the power supply fans can draw air through the front drive bays. 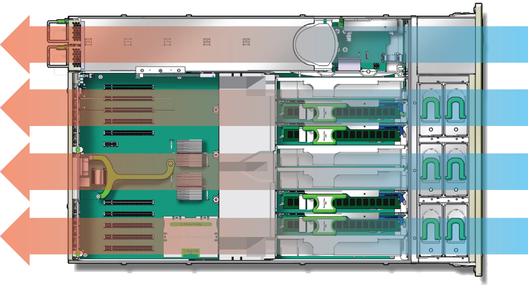 The server draws cool air from the front of the server and expels hot air out the rear. Allow a minimum of 5 mm (0.2 in) clearance at the front of the system and 80 mm (3.1 in) at the rear of the server when mounted. These clearance values are based on the preceding inlet and exhaust impedance (available open area) and assume a uniform distribution of the open area across the inlet and exhaust areas. Clearance values greater than these are recommended for improved cooling performance. Note - Be mindful that the combination of inlet and exhaust restrictions such as cabinet doors and the spacing of the server from the doors can affect the cooling performance of the server.